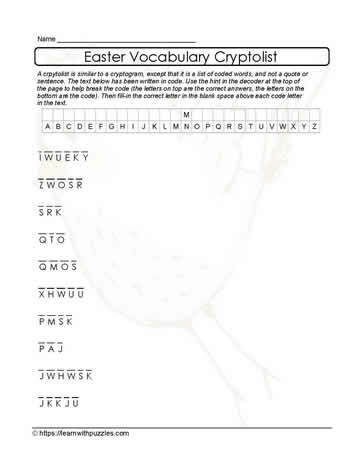 This hint enabled Easter cryptolist supports students' vocabulary building skills, approaches to puzzle challenges while making learning fun. Students need to decrypt the alphabet code used in this puzzle. Record letter substitutions in the decoder at the top of the puzzle. Grades 3,4,5, classrooms, tutoring resources, home schools. Use DI to support struggling readers, ELLs in the classroom.